Suspension keeps tyres in contact with the road surface, and eliminates road shock. Steering, is your vehicle veering to one side when the steering wheel is straight, or if you can hear noises when your vehicle is turning, you may have a suspension issue or it may also be a Wheel Alignment issue. Did you know: Vehicles must be lowered correctly to gain a Warrant of Fitness? 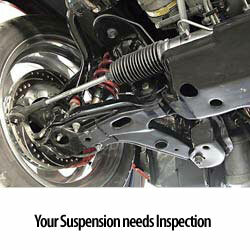 If you want to lower your suspension, see us for specialist support. All cars have springs that control the height of a vehicle. Shock absorbers control those springs. If your shock absorbers are faulty the spring will bounce your tyre off the road. If my brakes are in good condition, then should I have a problem stopping? If my shock absorbers are worn, will I notice it when I drive my car? Shock absorbers wear gradually. We often don’t notice they are worn as we adjust our driving habits. Unfortunately this does not limit the potential danger of driving on worn shock absorbers. If my car has just had a safety check will my shock absorbers be ok? In a safety check your cars shock absorbers will almost always be checked for leaks or broken mounts. However to ensure your shock absorbers are operating efficiently a car should undergo an electronic shock test or a bounce test by a shock absorber safety expert, at the shock shop it’s free and just takes two minutes. For your peace of mind and the safety of your car and passengers it is worth it.